We took the train via the Conway Valley to Snowdon National Park in Wales, alighting at Holyhead. The hills and pine forests with snow-capped mountains in the distance enchanted us. As it snowed heavily, the weather prevented us from hiking up the mountain. The sun showed its face at Conway Castle and the Peak District, smiling at us as we rambled among the ruined ramparts, climbed the parapets and looked down at the countryside. We’ve always been attracted to ruins, and I recalled the old haunted house in Portland, where Colin played with his childhood mates. At Edale, the start of the Pennine Way, we set out for a long hike. Chased by a snowstorm, we hurried back after a short walk by the canal. Before departing from the Peak district, we went to Bakewell, home of the famous Bakewell puddings. The aroma of freshly baked cakes lured us into the shop. The delicious cake melted in our mouths. We dropped in at Eyam where, in 1665, the villagers chose to isolate themselves at home rather than travel and take the plague to surrounding villages. I leaned forward to read about the courage of the people and my pulse raced at the thought of their concern for the safety of others, marvelling at the ancient village, which thrived long before white settlement in Australia and still survives in its original setting. 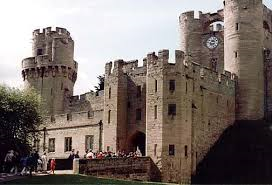 Warwick Castle at Easter presented the days of yore. Knights, knaves and kitchen maids went about their chores, seemingly oblivious of wide-eyed tourists. A sea of colourful tents lent an air of authenticity to the atmosphere. A procession of knights in armour filed past. A mock battle followed. My heart beat fast to see how people lived during those times. From Chester, the train passed through wild country on its way to Carlisle. I was enchanted by the beautiful Royal Doulton plates decorated with fairies, which covered the walls of the bed-and-breakfast accommodation. The train travelled to Haltwhistle, where we took a taxi to Hadrian’s Wall, which had been built by the Romans to keep out the Scots. From the ruins of a Roman garrison, we looked down from the ramparts on to the verdant pastures. Cattle grazed tranquilly. Had the Roman guards had enjoyed the peace and quiet too, or did they have to be always on the alert against the enemy? Peter Rabbit and other characters came to life at Beatrix Potter’s World in Bowness at the Lakes District. We boarded a double-decker bus and alighted at Ambleside and had a pleasant walk in the village. Grassmere and Windermere were overflowing with tourists. We rambled in the same pristine places that inspired Wordsworth. The scenery was exquisite, leaving us longing for more. A scenic rail trip took us past snow-capped mountains to Inverness, where on a tour of Loch Ness, we hoped to catch a glimpse of the elusive monster. We wandered along the banks of the river as far as the Ness Islands. Passing clear lakes and snowy mountains dotted with pines, we arrived at Kyle of Lochlalsh, but we missed an opportunity to visit Skye, made famous by the Skye Boat song which I’d learned as a child from my music teacher. 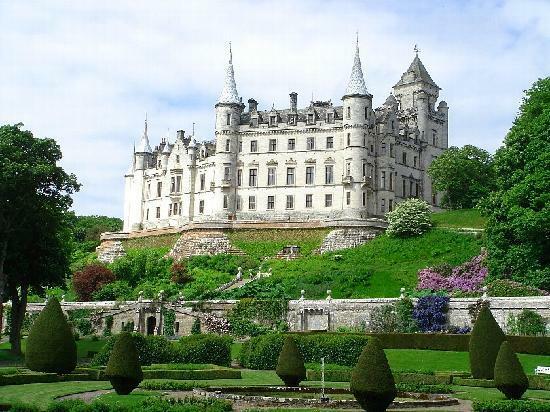 From Inverness we travelled to Golspie and hiked on the path by the sea to Dunrobin Castle, home of Lord and Lady Sutherland. Our childhood dreams of fairy tales came alive at our first glimpse of the stronghold perched on the hills. The furnishings were splendid, the gardens charming. Hazel and I wandered around, calling to mind another garden in Adelaide, where we had rambled together, lost to everything else when we fell in love. We chose to return to Golspie via the woods, then by train back to Inverness, charmed by the hospitality of the Highlanders, the beauty of the land and the fine weather. Across the border, Nottingham welcomed us with a shower of rain. My cousin Paul was at the station to greet us. Uncle Clarence was waiting for us at Paul’s home. He was thin and tall with snowy, white hair and clear blue eyes suffused with kindness. Our fondness for him grew each time we met. We had a family gathering, getting to know the other cousins June and Geoffrey. On our previous trip, Clarence had taken us to Orlando Drive where Mum was born. Now he drove us to Sherwood Forest. The great oak, beneath which Robin Hood bled to death, still stood, its large horizontal branches propped up by beams like the crutches of an aged man. The tree is reputed to be over one thousand four hundred years old. From London we visited Dover Castle, where we entered the secret wartime tunnels and learned how they were used during hostilities. We spent our last days in London at the Portobello markets and Petticoat Lane. Here Hazel threw up her hands with delight at the sight of the souvenirs. She bought three teapots with Shakespearean themes painted on them, besides other curios.